Christian Leaders Call Us All To Prayer on Thursday, May 3! Dr. Ronnie Floyd is the new National Day of Prayer president and as such, he leads the nation in the official prayer this year. A video of the prayer is now online at nationaldayofprayer.org/national-prayer. You can pause at your home or workplace or gather with some friends and co-workers to watch the video and join the nation in prayer. You might participate in one of the many prayer breakfasts or gatherings in your local community or nationwide on May 3. You can find an event near you at the National Day of Prayer website. You could travel to Raleigh to take part in activities in our capital city. Organizers are encouraging people to prayer walk around the Legislative Building any time from 7 to 11 a.m., either as individuals or in groups. Then, join the prayer service at noon at the Halifax Mall near the Legislative Building. Information on parkingcan be found on the Capitol Commission website. 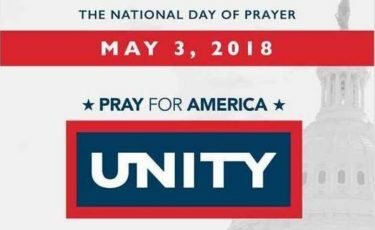 You can live stream the National Observance at 7:30 p.m. on Thursday by going to the National Day of Prayer website. No matter how you choose participate, take some time on Thursday to join in as we all cry out to God to give us His unity through the Gospel of Jesus Christ in our families, churches, workplaces, communities, state, and nation.